In early April 2012 we went to SaveABunny to look at a rabbit to adopt. When we went to SaveABunny we looked at about 6-7 bunnys. I knew nothing about rabbits then. This was a girlfriend idea. I was sitting on the floor and Marcy put a few rabbits in the pen with us. Then it was Lady Gaga's turn. I would hold my hand out and Marcy would tell me (about 6 times) they are not dogs and won't sniff you. Only one to sniff my had was Gaga. She did this every time I held my hand out. Now I know she was only looking for treats :) She was the one. At first we called her Bunniwae. This is from one of my favorite movies StarGate, Bunniwae video clip here. We then started calling her BunnyGirl... and it stuck. So when we got a boy two months later it was automaticly BunnyBoy. A lady that was wanting to adopt out her 3 month old grey lop. It turns out she had bought him from a breeder who said he "was a she." She already had a male and wanted a female for him. Turns out all they did was fight. She only found out when she took "her" in to be spayed. The Vet told her she was a he and that was the cause of all the fighting. When we met and picked up BunnyBoy, her old mom was very very sad and did not really want to give him up. Even the mom's boyfriend/husban was sad. We were lucky to find him. He is very sweet and listens well. We were looking at maybe getting a 3rd bunny. We saw Grant and visited him twice at two different events. He was a big sweet Mini-Lop. "This special guy overheats and needs an ice bottle to lie up against when he has hop time in the house." We are not home during the day so this might have been a problem. We were glad when both Grant & Freckles found their forever homes. I do a lot of google'ing on everything rabbits. I participate on /r/rabbits on reddit.com, Rabbitors on facebook & IRC, they are on bunspace.com [BunnyGirl & BunnyBoy] and rabbitsonline.net and have had their pictures posted on dailybunny.com [Too stuffed to move, We Refuse to Give You a Good Photo With These On... & Take all the Easter Pictures you want...] and dailybunny.org [Thanksgiving Hats]. 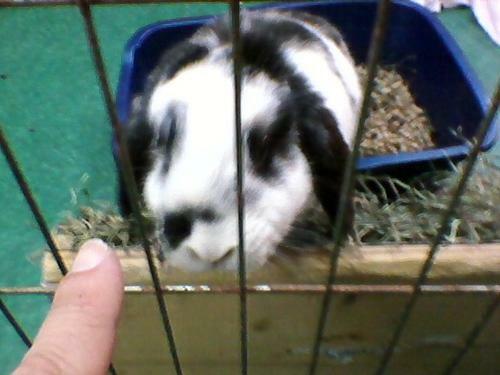 Starting in April 2012, after getting BunnyGirl, we would purchaced hay at the EBRR adoption events. We would make a visit every 2 or 3 weeks. We would get fresh hay, save money, help support the rescue and of course get to pet more bunnies! I am always looking to learn more about the Oryctolagus cuniculus. Volunteering and helping out is a great way to learn. Being able to watch many different rabbits and observe how the go about their business is extreamly helpful and enjoyable. The rescue is just the right size. All the ladies there, each with a different rabbit background, are a great resource for information. 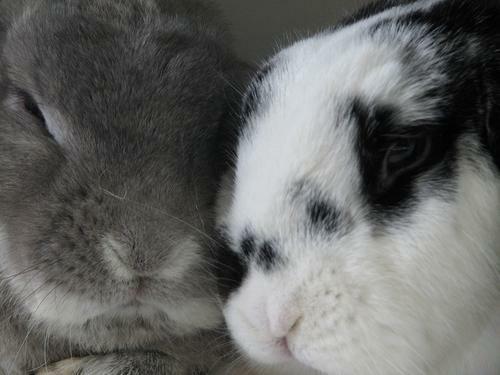 The hard part is 'bonding' with a rabbit and then see him/her get adopted. My two favorites so far have been Racer and Tatianna. Page © 2012-2019 RCR. Page hits: 2779 since July 4th, 2012. All information © of its respective owner(s).